WASHINGTON – When Pope Francis approaches the Catholic Charities building in downtown Washington during his upcoming U.S. visit this month, he will encounter a “homeless person” covered in a blanket laying on a park bench. If the pope does bless the 7-foot-long statue, it will be the second one of its kind that he’ll have done that for. Pope Francis blessed a smaller version of the “Homeless Jesus” sculpture during a late November, 2013, general audience at the Vatican in front of thousands of pilgrims. Schmalz also created the “Homeless Jesus” statue in Washington, as well as similar sculptures in place in Toronto and several U.S. cities that include Denver, Phoenix and Chicago. 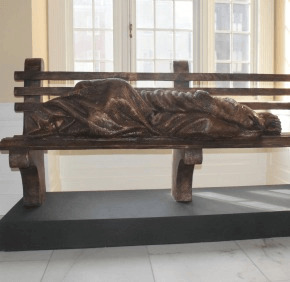 The arrival of “Homeless Jesus” in Washington came last winter after Washington Cardinal Donald W. Wuerl witnessed the pope’s 2013 blessing of the smaller such statue, said Monsignor John Enzler, president and CEO of Catholic Charities of the Washington Archdiocese. “It’s deceiving when you first look at it, because it looks like a homeless person wrapped in a blanket laying on a park bench,” Monsignor Enzler told Catholic News Service during a recent Wednesday evening Catholic Charities-sponsored dinner for the homeless, held just a few steps from the statue. “When you get up closer you realize it’s a sculpture,” he said. Such reaction is what Schmalz envisioned when he began working on his first “Homeless Jesus” sculpture in 2011. Viewers are forced to take a second look at the sculpture of a human wrapped in a blanket, face covered, with only the feet exposed, to recognize that it’s actually depicting Jesus, Schmalz said. Monsignor Enzler said Washington’s “Homeless Jesus” has inspired some to have a more compassionate view of the homeless and has provided the poor with a little dignity.